This software is new for all of us.... If you have any questions - post them here and we'll try to answer in a timely manner. We in turn ask that you look around a LOT. Is private messaging no longer supported? Also, I note that certain administrative forums appear to have disappeared. Laserlight - I sent you a PM .... It's a little weird in that PM's are private discussions with in a section like Feedback or any other are of the site...versus within an special area. There currently isn't a private site staff section .....yet. Note that users can user-> can either use BBCODE or Markdown to format posts. Currently system generated emails are disabled... If you Follow/subscribe to a post you have to reply on the BELL Notification icon at the top right. And Currently regular members can not upload/attach files to posts. As warned, existing attachments didn't survive the transition. I haven't found all the moderator tools yet. I see "lock" and "delete" options when I click the "v" dropdown on the "reply" button to the right, which I'm assuming are only available to mods/admins? (I have already cleared out a bunch of spam, and suspended the posters, so I have found some of the tools). It also looks like moving a thread is a matter of changing its tags; but there are other things. Email notification and uploading of files has been enabled. Yes there were some posts that should have been deleted and the person banned... Just do it again as you find them. Changing tags is the way to move threads. There isn't a re-direct function. How about splitting and merging threads? I haven't seen the options to do either... Just have to do it manually and ask them to start a new thread/don't hijack others. Hmm. 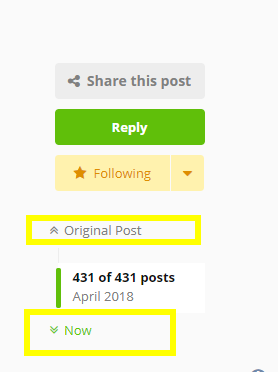 A lot of us "regulars" used signatures with links to answer FAQ and more/less enforce/influence community opinion ... that doesn't appear to be an option now? Hmm...in preview mode the image was displayed, but upon submitting the reply it only showed the ALT text. Yes, Weedpacket, I was making an observation for those of us whose observational skills aren't on par with yours.